HepcoMotion’s HDRT (Heavy Duty Ring Guides and Track Systems) have been developed specifically for high-performance applications. HDRT guidance systems are characterized by their ability to carry very high loads – moving reliably and accurately with very little wear. At Eurocylinder Systems AG, a leading manufacturer of high-pressure steel cylinders, the HDRT guidance system has proven itself in a demanding production environment with large amounts of contamination and residues. Eurocylinder Systems AG is a medium-size company in the metal processing industry. Eurocylinder produce high-pressure steel cylinders for the storage and transportation of compressed, liquefied and dissolved pressure gas used in technical, fire protection, diving, beverages and medical applications. The high-pressure steel cylinders are made from steel tubes. The steel tubes are cut into casings of the required length, between eight to twelve metres. The wall thickness varies from three to nine millimetres, with six different diameters – 140, 172, 178, 204, 229 and 267mm. At the plant, around 1000 casings are cut per day. Every year, Eurocylinder Systems produces approximately 500,000 high-pressure steel cylinders. The plant is predominantly operated in rolling shifts or in three-shift operation and is in operation for over 300 working days per year. Historically, the cutting of the casings was done using two bandsaws. For this, the supplied tubes were cut into casings of the required lengths with vertical cuts (perpendicular to the tube axis). This was a lengthy process that took up to five minutes per cut. Eurocylinder Systems wanted to optimise this complicated and long process. In 2009 the bandsaws were replaced by a plasma cutting machine. 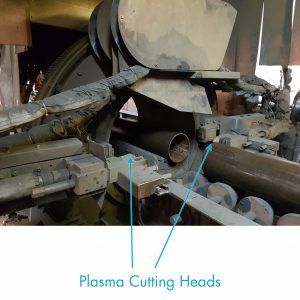 The cutting head of the plasma system has two plasma torches. They are placed opposite each other and rotate during the cutting process on a circular path 180° around the steel tube. One cutting head is responsible for the upper half of the pipe, the other for the lower half of the pipe. A complete pipe cut takes between five and ten seconds, depending on the tube diameter and thickness. The holding and guiding of the whole cutting head is done by two HepcoMotion HDRT guide systems. 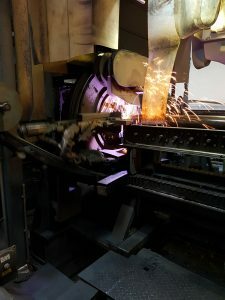 To guide the plasma cutting heads along a prescribed circular path, a ring-shaped high-performance guide system was required that can meet the required operating times free of faults. The main requirement was to install a guide system that can be wear-free and low-maintenance in operation. In addition, the rings need a high load-bearing capacity to support the entire cutting head (approximately 150 kg in total) and operate at the required rates. The plant is in a hall subject to ambient temperatures. The guide must therefore be resistant to contamination arising from the production process and withstand the external influences – in particular, the temperature variations. This means that the plant and the guides must be operable with minimal downtime during any weather, in any season, with temperatures between ‑25°C and +40°C. Due to the technical conditions of the plasma cutting process, large amounts of combustion residues and contamination are produced during this production step. During the cutting process, the burnt material is carried into the interior of the pipe casing by the plasma jet, which causes problems later on in the processing. The casings must therefore be cleaned following the plasma cutting. Rails and guide systems also become polluted with slag splashes and fine dust deposits from the plasma fumes. For this reason, Eurocylinder Systems installed a special housing with a felt ring seal for the HDRT rings that protects the HDRT rings from external influences such as dirt and dust. To withstand the demanding environment, HepcoMotion configured a solution consisting of two heavy-duty rings. 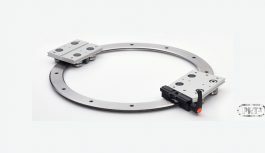 These rings feature Hepco’s V guide technology that delivers a self-cleaning action, which means that any contamination is wiped away by the V bearings as they run along the rail. HepcoMotion has been leading the development of V Guide technology since 1969, and continues to develop innovative linear products that offer new solutions to design engineers. In this application, each ring has a diameter of 786 mm and is made from hardened high-quality tool steel. The HDRT running surfaces are precision-ground. 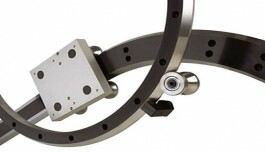 The two parallel rings each use four 95mm diameter eccentric V bearings for the high loads. Lubrication is provided by four lubrication blocks (two per HDRT ring). The blocks are made of impact-resistant plastic including a spring-tensioned, lubricant-soaked felt wiper for low-friction lubrication as well as high load capacity and lifetime. The lubrication blocks have now been in service for seven years without being refilled. 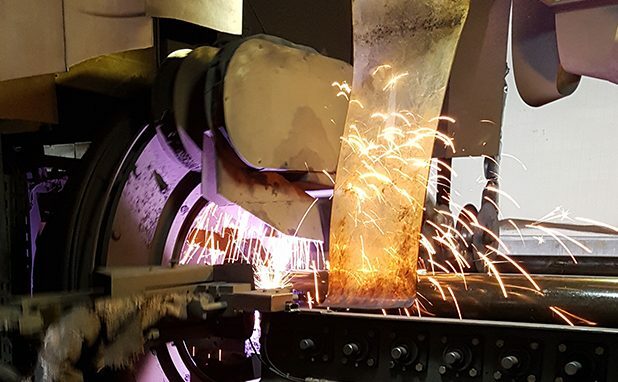 The main aim of Eurocylinder Systems was a major optimisation of their plasma cutting process while at the same time accelerating and automating the cutting process. 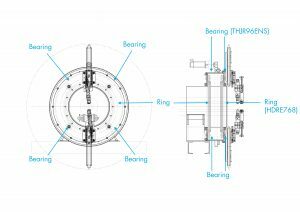 Eurocylinder Systems is very impressed with the new solution – in particular with the HDRT rings for fully meeting the requirements. Using the bandsaw, up to four pipes were cut simultaneously, depending on the diameter. The bandsaw required five minutes, just for the cutting. With an overall cycle time of about six minutes, that means 90 seconds per casing. The plasma cutting system only needs ten seconds for one cut. The total cycle time amounts to about 30 seconds per casing. The time saving is therefore about 60 to 70%, if the tube length, diameter and wall thickness are the same. The system has been in use since 2009, and the HDRT rings at the cutting head of the plasma cutting system have not required any maintenance. The entire system and the HDRT rings have now been running for over seven years, without any errors or faults, demonstrating how strong and resistant the HDRT guidance system is. The HDRT rings are highly tolerant of dirt thanks to the geometry between the V guide and the V bearings which has a ‘mill stone effect’ caused by the different peripheral speed inside and outside the V form. The difference in speed causes particles of dirt nearer the centre to move outwards towards the periphery, and to be expelled. The plasma cutting heads are guided by the HDRT rings. One cutting head deals with the upper half of the tube; the other with the lower half of the tube. During the plasma cutting, there are considerable amounts of deposits and dirt – particularly slag and soot-like fine dust. Both the plant and the HDRT solution from HepcoMotion are exposed to this, but have now been in place for seven years without any maintenance or failure. Profile and front views of HDRT ring assembly with plasma burners. Two heavy duty single edge rings are each guided by four V bearings.